In 2012, the Census Bureau declared that in 2011 most children younger than age 1 were minorities. The bureau’s population estimates also indicated minorities were the majority among babies in 2012. But when the bureau released its 2013 estimates, it revised those earlier estimates to indicate that, in all three years, newborn non-Hispanic whites still outnumbered minorities, by a small margin. The estimates released this year included revised 2013 estimates that now say there were about a thousand more minority babies than non-Hispanic white babies that year, a tiny difference given that each group numbered more than 1.9 million. In 2014, minority babies outnumbered white babies by about 16,000, and in 2015 the difference was about 12,000, according to the agency’s estimates. The Census Bureau frequently revises its past population estimates to account for newly available data. Birth data is a special problem: In estimating the number and characteristics of newborns, the agency relies in part on birth certificate information from the National Center for Health Statistics that is two years out of date. 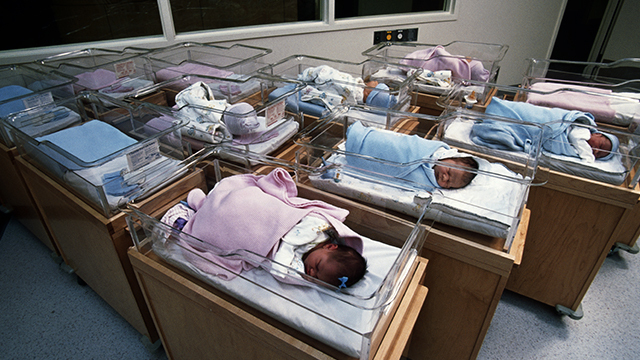 One reason that the bureau had to delay its claim of a majority-minority newborn population may have been a sharp falloff in births and birth rates after the onset of the Great Recession in 2007. Birth rates declined most steeply for Hispanic and immigrant women. 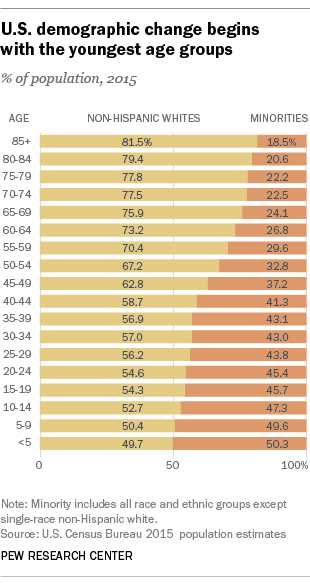 The Census Bureau statistics indicate that demographic change is percolating upward through the nation’s age groups, starting with the youngest ones. In fact, the bureau estimates indicate that 50.3% of children younger than 5 were racial or ethnic minorities in 2015. In the total U.S. population, non-Hispanic whites will cease to be the majority group by 2044, according to Census Bureau projections, or by 2055, according to Pew Research Center projections. Racial and ethnic minorities have accounted for most of the nation’s growth in recent decades. The non-Hispanic white population has grown too, but not as quickly. Minority populations have grown more rapidly in part because these groups are younger than whites and include a higher share of women in their prime child-bearing years. Some minority groups, especially Hispanics, have higher birthrates than do non-Hispanic whites. In addition, a rising number of babies are being born to couples where one parent is white and the other nonwhite.